The world of Code 46 (2003) is one where global warming and concurrent climate changes have caused most of the world become overrun with desert. There’s ‘al fuera’, the world outside, and there’s inside, gleaming, luminous city-states – affluent urban environments that have retrenched behind protected zones. Like Jean-Luc Godard’s Alphaville (1965), the film creates a convincing alternate near-future urban reality from ‘found’ locations – in this case, Shanghai (China), Dubai (United Arab Emirates) and Jaipur (India) – all jigsawed together to create the megapolis of the future. Code 46 deliberately eschews the artifice of imagined worlds, an antidote to an overload of CGI-enhanced science fiction realities. Careful framing and choice of locations emphasize the ‘futuristic’ nature of contemporary spaces. The film’s vision of the future was formed from prolific British director Michael Winterbottom’s experiences of cross-border migration – the roadblocks and bureaucracy – while filming his previous film In This World (2002), which followed the journey of a couple of Afghani refugees from Northern Pakistan to London. Thus, the idea of ‘papeles’ – IDs as half-passport, half-visa – the documents needed to travel and gain access to the sheltered urban oases in this near future came about. ‘Papeles’ and ‘al fuera’ mean ‘papers’ and ‘outside’ respectively in Spanish – in the near future languages merge to form a multicultural lingua franca containing English, Spanish, French, Chinese and Arabic influences. 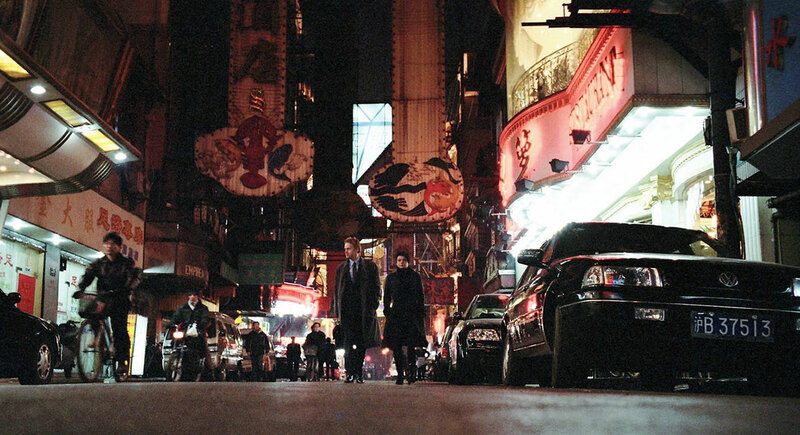 Code 46’s plot revolves around insurance investigator William Geld (Tim Robbins), who travels to Shanghai to investigate the fraudulent production and illegal exchange of papeles from within the multinational Sphinx Corporation. His research focuses on a small group of printers, including the guilty culprit, Maria Gonzales (Samantha Morton). Attracted and intrigued by the young woman, he impulsively decides not to report her. They spend the night together, after which William returns home to his family in Seattle. Back at work at Westerfields Insurance Corporation, he is alerted to the death of Damian Alekan (David Fahm), a friend of Maria travelling to Dehli on papeles illegally issued by her. Geld returns to Shanghai and discovers that Maria has checked in at a medical clinic. There she has undergone an abortion, since William’s and her child formed an infringement on Code 46, deeming every relationship between partners who are too genetically similar illegal. The authorities have erased Maria’s memory of every trace of William, their meeting and resulting pregnancy. William and Maria head to al fuera, into the vast desert-areas between the prosperous city-states of the globe. Here, outside the controlled access-zones of the urban megapolises, living amidst the poor and disenfranchised in the free port of Jebel Ali, William and Maria hope to rekindle their love. But their happiness is short-lived: Maria reports William and herself to the authorities, an involuntary reflex the medical engineers have planted into Maria’s subconscious during her abortion. The lovers are forced to flee again, resulting in a car crash in the desert. Both survive, but following the accident, the authorities erase William’s memory. He returns to his life in the US, oblivious to Maria’s fate. Without papeles Maria is forced to stay al fuera, joining the marginalised millions heading for an uncertain future. Director Michael Winterbottom stated that, apart from papeles, everything else in Code 46 is an extrapolation of the present. In this ‘near future,’ climate change has transformed fertile areas into arid deserts. The ozone layer is depleted and people are afraid to go out in the daytime, so they work at night. Because of these changes, living outside of a controlled urban environment is very hard, so everyone wants to live in the city. Which means that the cities are even more densely populated than now, and in order to control that urban space papeles are introduced: a kind of privatized visa system, which gives those who have official papeles permission to live in the city. The disenfranchised people without papeles live al fuera, in the desert area beyond the city limits. Production designer Mark Tildesley pieced together a ‘creative geography’ for the film. A scene might be made up of a few different locations, different pieces of buildings existing, in reality, thousands of miles from each other. Winterbottom and Tildesley chose Shanghai and Dubai as locations because of their extraordinary, contradictory architecture. In Shanghai there is Third World poverty in the shadow of some of the most modern skyscrapers in the world. In Dubai there is the skyscraper area of the city and then just behind it, the desert. It was those curious juxtapositions which were interesting and attractive to both Winterbottom and Tildesley. The concept of Code 46 was to foreground the love story with a genetic slant, and in doing so create a consistent emotional space rather than a gadget-ridden futuristic world. The vision of the (near) future created for the film is compelling, meditative and melancholic, but also slightly disquieting. The dream of globalization has soured into an overly surveilled and controlling world (echoes of the US Patriot Act can clearly be felt throughout the film), where even sexual partners need to be DNA-vetted (a consequence of much of the population being born from in-vitro fertilization and originating from human clones). Code 46’s outlook evokes the futurist visions of authors such as J.G. Ballard and William Gibson, in which the world has done away with nation-states and ethnicity. Vast deserts are interrupted only by run-down settlements and sleek shimmering city-state protectorates. Shanghai’s waterfront, dominated by the Oriental Pearl Tower, acts as Code 46’s most impressive set, while sterile, neutral zones of airport terminals contrast with the earthy nature of life al fuera. Shanghai is a perfect location because, much more than any other city, it is undergoing a rapid transformation into ‘the city of the future’. The already SF-inflected design of the Oriental Pearl TV-tower in Pudong clashes up against the Art Deco mansions of Shanghai’s faded colonial past. Yet it makes perfect sense that Pudong’s new skyscraper district should coexist with Puxi, the older part of the city across the Huangpu river. Director Michael Winterbottom and cinematographers Alwin Kuchler and Marcel Zyskind utilize the sterile, highly international architectural style of skyscrapers in Shanghai and Dubai, and contrast them with colonial pasts, echoing the film’s protagonists’ wish to dirty their genetic purity. Code 46’s dystopic SF-reality is a world fractured into city-states, internationalist but isolated. A world of transience, of airport check-ins and motorway checkpoints where people are as disconnected as the locations themselves. And where an authoritarian government exercises inflexible and total control over its citizens, under the guise of paternalistic benevolence. Papeles guarantee a life of affluence within the world’s megapolises, lack thereof assigns people to a life al fuera – outside – and to the status of social non-entities: poor, disenfranchised and forgotten, surviving beyond the fringes of society.